There was a time, say circa 1900 - 1930, when electricity was not the svelte, humming, discrete servant of today, but more of a clumsy novelty. The early power distribution grids were veritable Frankenstein's monsters: barely controlled lightning, loosely stitched together, terrorizing the neighborhood, and tripping all the time. Competing with this chaos was a motive force that seemed more understandable: compressed air. Harnessed natural forces like wind and water had been employed for millennia; in the 19th century, steam power elaborated and improved the scope of a natural force pushing for work. So compressed air seemed logical: like steam, but that you didn't have to keep hot. It seemed to solve particular problems inherent to steam pressure, which can only travel so far from the boiler before it cools and loses its, well, steam. Let us look at a few artifacts that exploited the possibilities of air pressure. 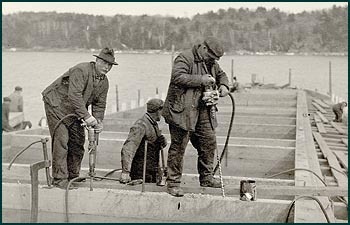 Like a team of reapers, each man in this gang bent over their wooden jointer planes at the Kelley, Spear shipyard in north Bath is cleaning up his own portion of what are likely the next planks to be affixed to the vessel rising in frame behind them, ca. 1900. The soft sliding snick of the tools along the wood would have allowed for some banter among them, if the mood was right. The merits of the air-powered hand-held planer in the foreground, ca. 1940, would have provoked debate among these men a generation later. It is possible to tell a joke and have it be appreciated by your fellows while hand-planing; not so anywhere near the deafening whine of the air-planer. Of course your fellows wouldn't be there to hear your joke anyway; you and your planer would have put them out of work. 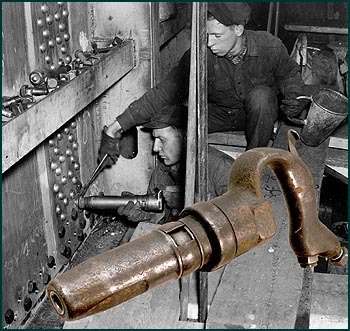 A ca.1935 air-driven drill in use making rivet holes in steel deck plating. 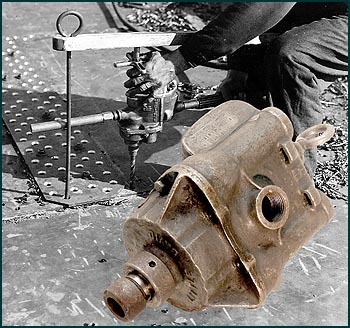 The worker has a simple rig to both arrest the tremendous torque of the drill and to lever it down through the plating. Cast into the chuck plate of our version in the foreground: "Little Giant". In this pre-extension-cord, pre-small-electrical-motor-environment, a compressed air line could be handily run and re-run through a busy shipyard, or quarry, or construction site to a continually moveable individual tool. Avoiding the hazards of combustion and electrocution, compressed air still reigns in many industrial situations. Somewhere inside a steel ship, ca. 1925, a heat-softened rivet has just been located in a vacant hole by the fellow reaching with the tongs. In his other hand he holds a large cup, into which the heated rivet was tossed by a worker tending a rivet forge nearby. His partner is about to round over the rivet head with a percussive pneumatic header. Temporary assembly bolts have been gradually removed as they work down the hull plates. The pace of the throw, catch, grab, set, and slam would have settled into a rhythm designed to get hot rivets into their holes as quickly as possible without tossing one into a shirt pocket instead of the cup. The new year, 1937, and the Ranger keel pour has been successful. 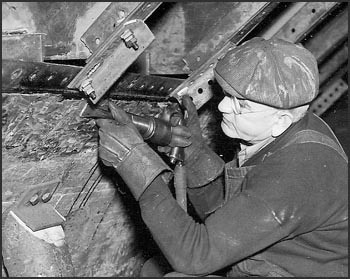 Using an air-chisel, this worker is fairing in the top of the lead keel to make a smooth transition to the hull plating. 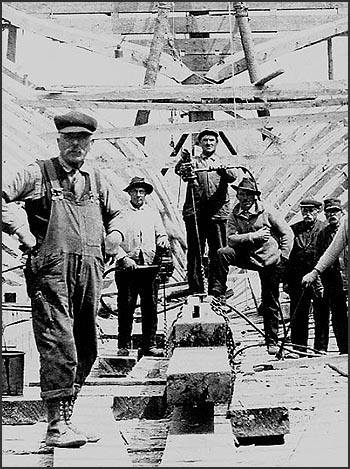 More air-powered drills, paused, posed, and poised to continue piecing together the keelson of a large wooden ship in Bath, just prior to WWI. 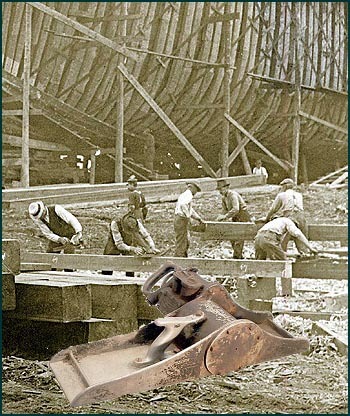 The rigidity of the keelson was crucial to the integrity of the frame; built up into the single most massive assembly in the vessel, the keelson's fastenings, both iron and wood, were many and long, demanding borings equally so. These air-driven augers were probably ten times quicker than the hand-turned variety, though they were quick to wring off if they hung up. Another fastening team at the Kelly, Spear yard, Bath, 1918. The middle fellow follows the driller, starting the steel drift pins. Using a jack hammer, the end of the procession drives the drifts home into the bulkhead timbers. Between the clatter of the two machines, there probably wasn't much talk here, either. The cans are likely to hold grease for both the auger and the pins. 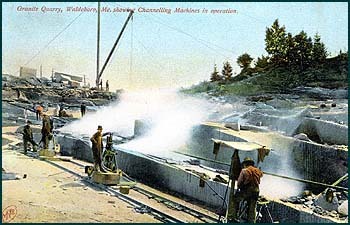 Until concrete spelled their demise, granite quarries in coastal Maine flourished, supplying East coast urban builders with material readily moved to its point-of-use by ship. Such demand could only have been met with the efficiency of air-driven tools, from the first ledge blast holes to the surfacing finishers. 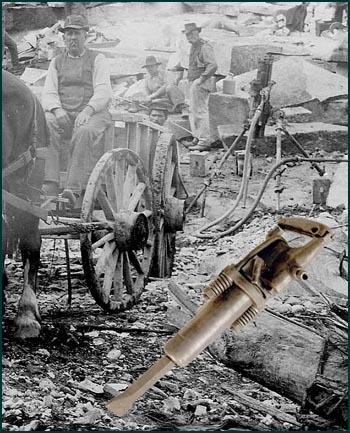 Above, a larger version of our quarry tool hammer (foreground) can be seen set up on stands, drilling into the next lower tier in the quarry. Lunch seems to be just ending: cigars are still lit, a water jug is still propped on a block, and the lolling fellow still has one boot to get back on. The white clouds in the postcard quarry view above are not steam, but rock dust thrown up by the air driven surfacing machines at work here, as they slide along temporary rails. If the wind shifts, driving the dust back toward the quarry workers, it will be an annoyance, but the real damage from the dust is the silicosis undoubtedly already degrading these men's lungs. The cheery varnished oak case and polished brass hardware of this diver's air pump almost invite one to give it a try; so simple, just have a friend turn the crank and you, too, can breathe underwater. The Bath Water District had to maintain their leak-prone city water-main which crossed under the Kennebec River from a reservoir in the next town. Air was blown through the pipe and the diver looked for bubbles, caulking the leaks with oakum, like a ship. It is unknown why this diver is at the edge of the ice, but his dive must be done for him to smile so broadly. May 11, 1892 and Hull #3 down the ways at Bath Iron Works. 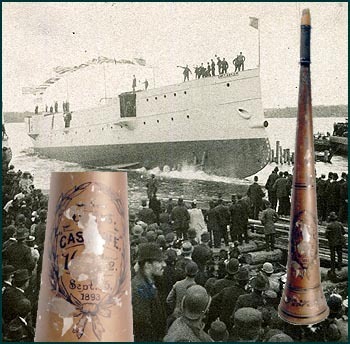 The peeling paint on this horn records an occasion worth blowing for, "U.S.S Castine, [16 ...] Sept. 15, 1893". The date is when this new Bath-built gun-boat surpassed 16 knots over her sixty-mile speed trial off New London for the Navy. 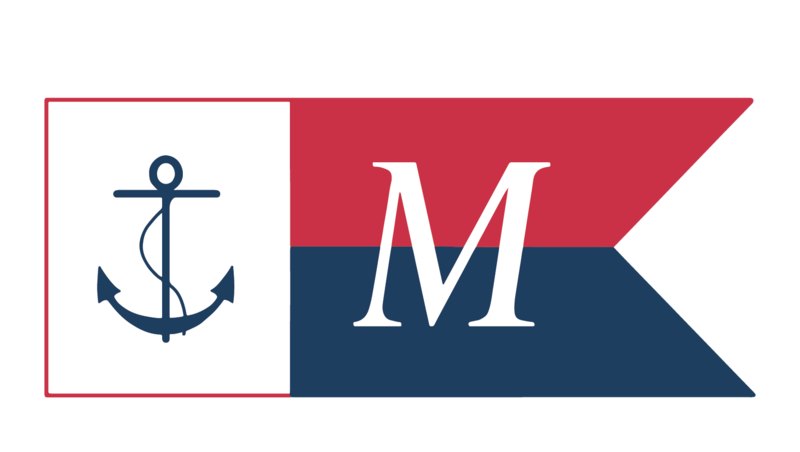 Ensuring the success of the fledgling Bath Iron Works, the telegraphed results from Connecticut were headlined, "Dirigo! Says the Gunboat Castine of Bath, World's Record Smashed. ... The news is everywhere received with great satisfaction and rejoicing." A tumultuous reception awaited the ship upon its triumphal sprint back up the Kennebec with "16" painted on her stack, greeted with the acclaim of the home-town crowd mightily blowing into this and, no doubt, other souvenir horns. With the advent of gasoline marine engines, and the resulting decline of steam propulsion, a jolly launch outing lacked one thing: a decent way to whistle. 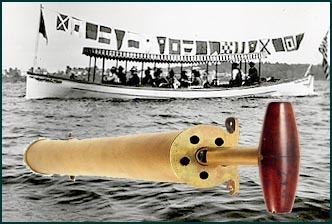 This brass and mahogany hand-pumped version was a solution, to be mounted handy to the helm. It has a volume considerably less than its high-pressure cousins, a toy signal for a toy boat. The care-free crew above seems to be toying with their signal pennants, too; they are spelling gibberish. Any shipyard required the services of a blacksmith for numerous fittings of the rigging, for various iron fastenings, and for mending, adapting, and tempering tools and other yard gear. Very similar to our collection version superimposed over his bowler, the folded pleats of this fellow's bellows can be seen just behind his right hand. 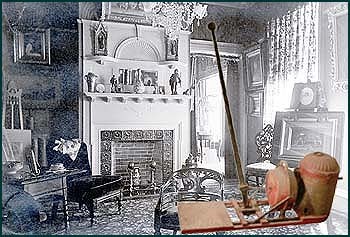 As he pumps the large lever (behind his head), the iron nozzle of the bellows directs air under the forge to the fire. The heat is very localized, so the wooden box that forms his forge tray is a simple solution. It may be filled with sand. The parting fog reveals a moment of truth in this Charles Copeland detail of a Banks fishing schooner deck caught in the midst of cleaning their catch. If they have such a hand-cranked foghorn (foreground), there may be just time to give one more blast and avert the collision. If they are merely yelling, like the left-hand fellow, the last thing they will hear will be the hissing bow-wave of the on-rushing liner. 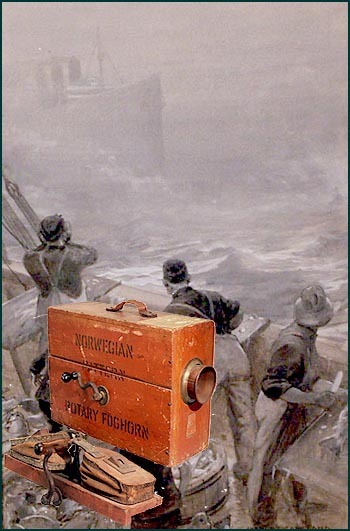 The internal double-bellows of another such "Norwegian Pattern" rotary foghorn is shown as well. A bellows that pulls rather than pushes, but moving air is still doing the work in this ca. 1910 household vacuum, the "Ideal" from the American Vacuum Cleaner Co. User technique required standing on the platform to anchor the rig, and not knocking over any bric-a-brac while pumping the lever. While this interior view of Bath's Galen Moses house is from 1885, the complexity of the feather-dustered terrain had probably not changed much by 1910, when this contraption might have been gratefully received, ideally. 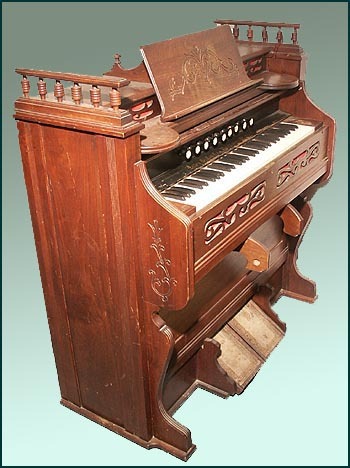 I'll end on a low note with this reed organ from the Estey Organ Co., Brattleboro, Vt., which used to be played aboard the Rockland passenger schooner Stephen Taber until its removal from the ship in the mid-1960's. The foot-pumped pedals operate an internal bellows that pulls air through to sound various brass reed arrays, a bit like a giant harmonica. 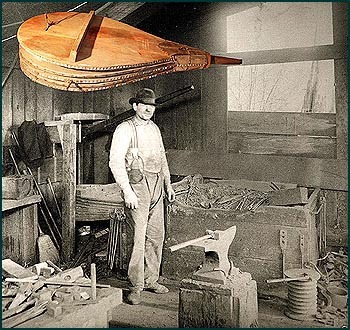 As well as being light-weight, compact, and inexpensive as compared to a piano, the metal reeds stayed in tune far better in the high humidity and lurching environment of a sailing vessel.